The Daily GRRR! HEADLINES for January 8, 2015. 1. 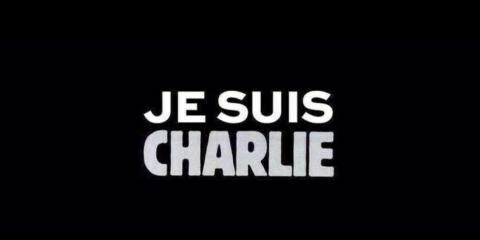 Charlie Hebdo Massacre. 2. Oil watch is back! 3. Veto Veto Vetooo Obama puts Keystone XL pipeline on ice. 4. Recommendations to keep Fossil fuels fossilised. Are Harper's climate change contributions lip service or will he act accordingly? (answer: don't bet on it). 5. Brrr, put another log on the fire. Merciless Cold besieges vulnerable community. 6. Bill Cosby! Finally! Over! Don’t hit yer arse on the door on the way out. Welcome, I am your host Trish Holmes and you are listening to The Daily GRRR! January 8, 2015 edition on 100.3fm, CKMS in Waterloo, Ontario. Soundfm.ca on the web. Today is January 8, 2015. The Daily GRRR! is a project of the Grand River Media Collective; and is supported by the Community Radio Fund of Canada and CKMS. Opening song: Yann Tiersen with La Valse d’Amelie. That was Yann Tiersen with La Valse d’Amelie from the soundtrack to the movie Amelie. That movie was based in Paris and I’m playing that in memory of the shocking attacks in Paris yesterday. Now this programme is pre-recorded on Wednesday night so if there are new developments, forgive me listener. But as Wednesday night, it’s a tragic mess. Some of the details are not yet clear but due to some excellent reporting and further excellent journalism, especially Amy Davidson in the New Yorker, as quoted below, what is known as of now is that at midday Paris time on Wednesday, ten staff at the satirical magazine Charlie Hebdo, including the editor and four cartoonists were killed, along with two Paris police officers when reportedly two or three hooded men, armed with AK-47s started firing. In addition to the dead, twenty people were injured. There is a video in which the gunmen can be heard shouting “Allahu Akbar” (God is great). President François Hollande said this was “undoubtedly an act of terrorism.” There are strong signs that it is an act of Islamist terrorism. The killings at Charlie Hebdo are a deeply unwelcome reminder to the West that for some, mainly young radicalised men, their fundamentalist interpretation of their religion matters enough to kill those who offend it. The dead include Stéphane Charbonnier, the astonishingly brave editor of Charlie Hebdo; the cartoonists Jean Cabut (who signed his work Cabu), Bernard Verlhac (Tignous), and Georges Wolinski; and the columnist Bernard Maris. Other names have not been released. France has seen much violence on its streets carried out in the name of religion over the past decades, but this killing still comes as a shock. Over the last few years, there have been a number of attacks including when the magazine was firebombed in 2011. Before Christmas three attacks occurred one in which a police officer was stabbed and two others where cars drove into crowds of people. In addition, Charbonnier was on Al Qaeda’s most wanted list in 2013. In particular in Germany just this week there have been demonstrations for and against the popular Pegida movement, which campaigns against the "Islamisation" of Europe. Brent Crude finished Wednesday at $51.10 although for a while on Wednesday it fell to $49.92, the first time it has dropped to below 50$ since 2009. Yeehaw. The Keystone pipeline, if you recall, is a a proposed 1,900km pipeline that would run from the oil sands in Alberta, Canada, to Steele City, Nebraska, where it could join an existing pipe. The $5.4bn project was first introduced in 2008. And It is the first major legislation to be introduced in the Republican-controlled Congress and a vote is expected in the House later this week. Mr Obama has been critical of the pipeline, saying at the end of last year it would primarily benefit Canadian oil firms and not contribute much to already dropping petrol prices. Despite the veto threat from the White House, the bill sponsors say they have enough Democratic votes to overcome a procedural hurdle to pass in the Senate but that they would be open to additional amendments to the bill. Including adding measures to prohibit exporting the oil abroad, use American materials in the pipeline construction and increased investment in clean energy. The BBC reports it is unclear if those amendments would gather the two-thirds of votes needed in both chambers to override Mr Obama's veto. Another important environment-related story that emerged Wednesday was an article published in Nature journal by University College London researchers that stated most of the world's fossil fuel reserves will need to stay in the ground if global warming is to be avoided. Over 80% of coal, 50% of gas and 30% of oil reserves, including those in the tarsands and in the Arctic, are "unburnable" under the goal to limit global warming to no more than 2C, say scientists. The study says there is no point in continuing to explore for new deposits of oil and gas anywhere in the world, since we cannot afford to extract what has already been discovered. A worldwide goal of a maximum two-degree rise over pre-industrialtemperatures has been set by the International Panel on Climate Change, and 195 of the world's countries (including Canada) have signed on to that goal. Already, mean global temperatures are about half a degree higher than they were before the Industrial Revolution, and carbon already in the atmosphere today would probably produce another half-degree rise even if all emissions stopped tomorrow. The study explicitly lays out the sacrifice needed from Canada. It says for the world to have a reasonable prospect of meeting the target, no more than 7.5 billion barrels of oil from the oilsands can be produced by 2050 — a mere 15 per cent of viable reserves and only about one per cent of total bitumen. One of the researchers is quoted "As a Saudi oil minister said in the '70s, 'the Stone Age didn't end because we ran out of stones. It's because we changed the technology.' And we're now going to have to change our energy system from one that relies on fossil fuels to one that relies more and more on renewable energy." It’s been cold cold cold cold out here in god’s country. -31 with windchill on Wednesday it was, -26 on Monday with windchill and today it’s going to be between -12 and -19 and feel like -23. But the KW Record reports that despite the cold, Kitchener's downtown 45-bed emergency homeless shelter on Frederick Street continues to run about half empty. The director of the shelter Elizabeth Clarke reports that there are people who prefer to tent throughout the winter. Which in this weather is incredible but it is testament to the KW area that both Outreach workers and Waterloo Regional Police are checking in with people in the cold weather, offering them help and supplies. Perhaps location is the problem for the shelter because in the Bridges at Simcoe and Water streets, where normal capacity is 40 beds, lately, 65 people are sleeping there. The Bridges also opens its doors as a public warming centre and about 100 people are dropping in on recent cold days. No one so far has died in the cold in Waterloo Region this winter, although two men died from the cold earlier this week in downtown Toronto. Finally, the Bill Cosby show went off at Centre in the Square last night. Matthew Kang of the CBC tweeted approximately 75% of the Square’s 2000 seats were full. He said the crowd was entertained, there were no hecklers and only a small protest outside. I haven’t heard yet how the voices carry gig went, but there you have it, now he’s Hamilton’s problem. And we are now moving into the feature portion of our broadcast. Closing Song: Edith Piaf with Je Ne Regrette Rien.